"The Selection Panel was deeply impressed with the awardees’ dedication to teaching, their tireless and creative efforts to make learning enjoyable and challenging, and the impact that they have made on their students’ learning. Because of the eminent achievements of two candidates for the University Distinguished Teaching Award, the Panel decided unanimously to honour both of them. The awardees will be honoured at a presentation ceremony on Monday May 9, 2016. Please do join us for that if you can. 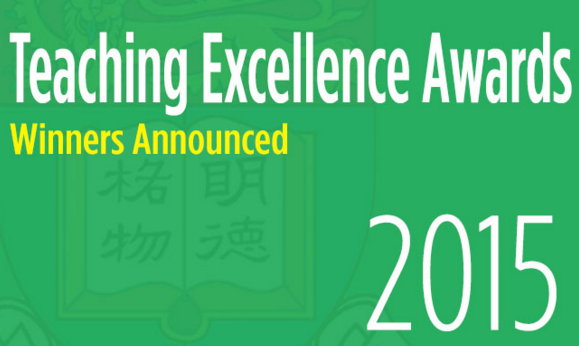 Their names will be posted on the Teaching Excellence Awards Honour Board." Dora is an exemplary teacher. She has helped junior-year students overcome the daunting task of acquiring legal skills that are crucial to their future success as a lawyer, designed a postgraduate JD course that suits the needs of the students, and taken up the shepherding role of Deputy Head (Student Affairs) in the Department of Law. Jianlin is a dedicated, enthusiastic and gifted teacher. He has designed new courses and used innovative teaching methodology in his teaching. He has also taken the initiative to organize seminars and workshops to promote research and presentation skills among undergraduate and postgraduate students. Nigel is one of the e-learning pioneers in the Department of Professional Legal Education. As a member of two e-learning committees, he has reviewed and promoted e-learning initiatives including MOOCs. He has also designed and implemented a new elective for the Postgraduate Certificate in Laws.